Bastion, the indie hit published by Warner Bros. Interactive Entertainment and developed by Supergiant Games, joins the OnLive marketplace. You can get the game in the US for $14.99 (PlayPack subscribers $10.49) and in the UK for £11.49 (PlayPack subscribers £8.04). You can play the free demo of Bastion powered by OnLive. The three games are SpaceChem, Avadon: The Black Fortress and The Great Jitters: Pudding Panic. Looks like OnLive is turning into an indie hit with so many indie games coming to the service. With the addition of these three games the PlayPack now stands at 115 games and counting. SpaceChem is an indie puzzle game already announced to be coming to OnLive. It was developed by Zachtronics Industries. In SpaceChem you take on the role of a Reactor Engineer working for SpaceChem, the leading chemical synthesizer for frontier colonies. Construct elaborate factories to transform raw materials into valuable chemical products! Streamline your designs to meet production quotas and survive encounters with the sinister threats that plague SpaceChem. You can play the free demo of SpaceChem powered by OnLive. Avadon: The Black Fortress is a deep old school RPG game with a cool and involved story. There aren’t a lot of games like that, so for people who like that niche, it’s a great title. This game was also already announced by its developer Spiderweb Software to be coming to OnLive. The first chapter in a new, epic fantasy saga. You will serve the keep of Avadon, working as a spy and warrior to fight the enemies of your homeland. As a servant of the Black Fortress, your word is law. Experience an exciting fantasy role-playing adventure and battle a conspiracy to destroy your people. You can play the free demo of Avadon: The Black Fortress powered by OnLive. The Great Jitters: Pudding Panic is an action puzzle indie title developed by Kunst-stoff. It has a metacritic score of 91 for iOS. This addictive action puzzle game is easy-to-learn, but hard to master: Explore 48 levels of the ghost train, defeat scary monsters, angry witches, crazy skeletons and fire-spitting dragons, and reach the exit before your courage energy is down. To be successful, you must be clever and quick: manipulate the tracks, exchange junctions and activate levers and bridges! Select from a variety of funny weapons and traps to scare the monsters back, trap the witches into loops and attack with the dangerous wind-up rat! You can play the free demo of The Great Jitters: Pudding Panic powered by OnLive. Revolutionizing the video game industry, OnLive is the first distribution service to successfully bring Cloud gaming to an international audience and is already inspiring the emergence of a new digital market. In this biographical article I hope to take you on a journey exploring OnLive Founder and CEO Steve Perlman’s career, aspirations, and his numerous accomplishments. Learn what has led this creative genius to the forefront of innovation in the Cloud: His journey may surprise you. After graduating from Columbia University in 1983, Steve worked on a parallel-processing graphics system as well as a massively-parallel 3D animation chip and a software-based high-speed modem at Atari and Coleco, respectively. Two years later he would join what has arguably become the most innovative company of our generation: Apple. Upon joining Apple Computer, Inc. as a principal scientist in 1985, Perlman spearheaded development of the video compression technology which led to QuickTime. Aptly named Road Pizza, the Apple codec supported live-action video and was included with the first versions of QuickTime to be released in 1991. Steve also developed a system-on-a-chip silicon for another company named General Magic, which was included within the first Windows CE PDAs and software-based high-speed modem technology deployed by Broadcom. Three short years would see Perlman take his first steps into the world of video games. In 1994, Perlman co-founded a company named Catapult Entertainment. Catapult introduced an online modem for the SNES and Sega Genesis systems which enabled the first successful online console gaming experience. Gamers could plug this XBAND modem into a phone line and use dial-up connectivity to play directly with or against other gamers on a selection of 28 titles spanning the two systems. The XBAND service was a direct precursor to modern online video gaming. Arcades were still very popular at the time and the concept of online gaming was ambiguous at best. Surprisingly, many of the features we take for granted today (leaderboards, private messaging, usernames, ranks, avatars, etc.) were present on the service, which, at its height, had 7,000 subscribed members. WebTV, like XBAND, connected through dial-up. It was a breakthrough device which gave affordable Internet access to a consumer base who, at that time, had many difficulties affording an expensive home computer. Because of this, Steve Perlman is credited with introducing the first true convergence product; combining Internet TV, interactive TV, digital TV, Digital Video Recording, and games into an integrated, simple and inexpensive consumer electronics device. It should also be noted that within 20 months of release WebTV, now MSN TV, was sold to Microsoft for over $500 million. Those teams went on to create the hardware for the Xbox 360, both of Microsoft’s TV distribution platforms, Microsoft's cable TV products, and IPTV. In 1999 Steve deployed the world’s first DVR through Dish Network. The Dishplayer Digital Video Recorder satellite receiver tripled the number of DVRs sold by all other manufacturers combined by selling over 200,000 units. But Perlman’s greatest accomplishments to date were still ahead, as the turn of the century would see him bring about a new advent in online interactive media. One of the greatest difficulties Steve Perlman faced in Silicon Valley during this time period was finding somewhere to do effective Research & Development. Steve’s time at Apple had afforded the opportunity to work on intensely creative projects like color Macs, sound technology, 3-D, animation, and QuickTime under heavy pressure (a great motivator). However, “by 1989 or 1990, we couldn’t get things through the system anymore,” says Perlman. Taking a position at Microsoft he faced similar problems, as competition was driving the company in various directions. Other possible options in Steve’s eyes included start-ups and universities; but the latter involves extremely scarce funding by comparison. As a solution to this problem, Rearden Steel was born. Rearden Steel, now Rearden Labs, or just, Rearden, was created in 1999-2000. Steve calls Rearden an incubator company: They take a look far into the future to see what technologies or production techniques might be needed, and go about trying to solve the problem. When they find a solution (or solutions) they think can work, those teams split off into a subsidiary company to focus on that problem. Steve also founded a home entertainment company in 2000 called Moxi Digital. This company would debut a STB (set-top box) which integrated Digital Video Recording, Music Jukebox, DVD player, and Internet Gateway into a single device called the Moxi Media Center. This technology could network wireless video, audio, and broadband throughout the home and is currently used by Comcast, Time Warner and Charter cable TV networks, among others. Little did we know that, just 2 years later, Perlman and Rearden Labs would begin developing OnLive, the first successful international Cloud-distribution video game service. Moving forward, in 2004 Steve began working with special effects geared towards cinematic film. The resulting technology, Mova Contour, first garnered worldwide attention when it was used to graphically enhance and alter Brad Pitt’s face in the 2008 movie, The Curious Case of Benjamin Button. This technology was heralded as a breakthrough in face-capturing for its unmatched realism and accuracy. See How It Works. Mova Contour technology can currently be seen in the trailer below for the Warner Bros. game Batman: Arkham City, which was released for OnLive in November, 2011. Mova’s work has included video game motion capture for Electronic Arts’ The Godfather, and From Russia with Love and Vivendi's Eragon. Steve also co-founded Ice Blink Studios with renowned artist Doug Chiang. Ice Blink’s work can be seen in major motion pictures War of the Worlds (2005), directed by Steven Spielberg; Monster House (2006), produced by Steven Spielberg and Robert Zemeckis; and Beowulf (2007), directed by Robert Zemeckis. A demonstration of his insight into the future of technology, one highly unpublicized mention must go to the fact that Perlman seeded initial funding into the Android operating system, supporting it and his friend, Andy Rubin, at a time when no one else would. With that we move into the debut of OnLive in 2009. Steve Perlman walked onto the stage of 2009′s Game Developers Conference and changed the face of gaming forever. Secretly in development for 7 years, the compression algorithm OnLive has introduced is the first of its kind to bring high-definition, high-end, over-the-Internet Cloud gaming to international consumers. In an interview, Steve Perlman said that his vision for the 21st century is the complete integration of cinema and video games; showcasing more realistic and interactive entertainment than we have ever known. Steve has claimed that Rearden, Mova, and OnLive will be combining their individual resources to bring an industry-wide shift in popular media through incredible 4K video resolution, unmatched realism with Mova Contour, and the possible use of DIDO wireless technology. Utilizing the resources and findings of Rearden along with its spun out companies, OnLive and Mova, Steve Perlman plans to build a gaming experience the likes of which the world has not yet experienced. Combining these technologies with the computing powerhouse of massive data-centers, OnLive has the potential to provide games and services which utilize enormous amounts of processing power at an affordable cost for the first time in history. Looking back on Perlman’s work we can clearly see how each of his projects has built on the foundation which has led to the creation and success of OnLive. Steve Perlman has been impacting the face of our technological landscape for nearly 30 years: His companies continue to inspire and impress an international market. As an avid follower of Steve’s work for the last 2 decades, I can only wonder with excitement and anticipation at how the OnLive project will continue to evolve. Steve Perlman once said, “Innovation is a dish best served hot,” and I truly believe this man’s legacy is barely heating up. OnLive usually releases games on tuesdays in the US, like the rest of the game industry. In OnLive's case, the games usually release during night, but not so this tuesday. OnLive tweeted that because of network maintenance, the PlayPass and PlayPack games will be released on tuesday afternoon. One game coming to OnLive today is already known, Spiderweb Software's Avadon: The Black Fortress. It will release as a PlayPack title in the US and UK. As you have likely heard, OnLive challenged the community on thursday. If the OnLive Facebook page could gain 10,000 Likes before Saturday, all current US users would receive a game of their choice for only $1. Well as you can predict the OnLive fanbase shattered this goal in roughly 7 hours and before day’s end the page had gained almost 13,000 Likes. However, the major concern in regards to this contest was all the newly registered users. But, OnLive has confirmed that they will continue this contest for the newly registered users if their page continues to gain Likes. They have not given an exact number, but the suggested total was 100,000 Likes by the next weekend. Continue spreading the word to help out all the new users that likely registered because of this contest. First time OnLive users can now purchase their first game for only $1. This greatly mirrors OnLive’s recent UK launch promotion, where new users to the service could and currently still can purchase their first game for only £1. If you’re new to OnLive in the US or you have yet to make your first purchase on the service, they would like to welcome you with exclusive savings on your first game. For a limited time, you can get a Full PlayPass to any game for just one dollar! 1. Create a free OnLive account and launch the OnLive app. 2. Choose any game in the Marketplace and select “Full PlayPass”. 3. Get it for a welcome price of just $1. It’s as easy as 1, 2, 3. What are you waiting for? Go here to sign up. 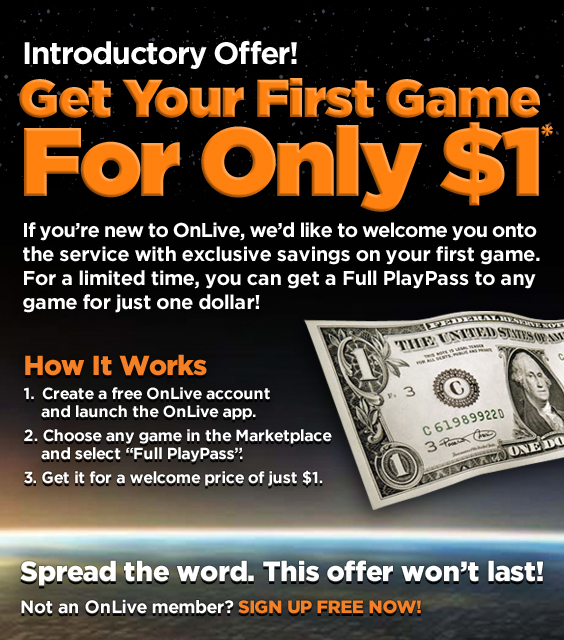 For a limited time only, first-time OnLive purchasers may purchase a Full PlayPass for $1.00 . Offer is not valid toward pre-orders. Limit one redemption per household. Available titles are subject to change without notice. Only valid within the contiguous United States while connected to the OnLive Game Service. Game purchases are not transferable. No cash value. Cannot be combined with other offers. ALL GAME SALES FINAL. NO REFUNDS. NO RETROACTIVE DISCOUNTS. This offer is not valid toward pre-orders of OnLive games. After the successful Facebook Like contest, OnLive has begun sending out emails to their happy customers. But instead of the $1 Game Codes we expected to receive, OnLive is sending out 98% off codes! This means that any game on the service will be $1 or less. If you decide to purchase a $49.99 title like Deus Ex: Human Revolution, the game will only cost $1. If you decide to purchase a $19.99 title, like Split/Second, it would cost a mere 40 cents. 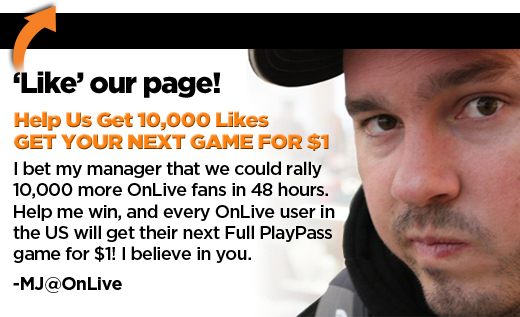 Thanks to some truly amazing support from our awesome OnLive community, we got 10,000 more OnLive fans on Facebook in just 7 hours, which means I won my bet with my manager, and every OnLive user scored their next Full PlayPass to a game for $1 or less! Now, the mechanics are a little different for new vs. previous purchasers, so this is what you need to know. If the Likes keep coming, brand-new OnLive users will get their first game for $1. For all of you loyal citizens who got the fire started (but have purchased games before), we’re giving you a thank-you discount of 98% OFF your next purchase. So a dollar or even less, depending on what you go for. The promo code is good until October 30th at midnight, PDT. It applies to any PlayPass titles on the service, but excludes pre-orders. This email is being sent to all users who have already purchased a game with their OnLive account prior to the contest. Finally, do not forget to like OnLive on Facebook, so that the $1 OnLive game deal continues for new fellow OnLive gamers! SOURCES: OnLive Informer 1, 2 and 3. A demo of FIFA 12 is now available to play through YouTube with no download, powered by Gaikai. Clicking the demo banner on the game's YouTube page will launch a new window in which the game runs. The demo uses standard mouse and keyboard controls as well as controllers. This is the first time a full 3D game has been available on YouTube, and could have profound consequences for developers who will be able to get their games out to a very wide audience quickly. Here is hoping that EA brings the FIFA 12 full game experience to OnLive, since EA titles will start appearing on OnLive. Who wants to buy FIFA 12 for his PC based on a cloud powered demo and then find out that the game doesn't run on his PC? You can try the demo of FIFA 12 on the Youtube page, if you are deemed worthy by Gaikai, which isn't easy to achieve. You can also get to the FIFA 12 demo if you visit the Gaikai games page. L.A. Noire: The Complete Edition is now up for pre-order on OnLive. Those who pre-order the game will get 10% off the purchase price, that is $44.99 (PlayPack price $31.49) after discount in the US or £31.49 (PlayPack price £22.04) in the UK, plus $10 off another purchase from the OnLive service in the US or £5 if you live in the UK. The normal price for the game will be $49.99 in the US and £34.99 in the UK. L.A. Noire: The Complete Edition will release in the US November 8, 2011 and in the UK November 11, 2011. Purchase a Full PlayPass for "L.A. Noire: The Complete Edition" between October 20, 2011 (9:00AM EDT) and the OnLive game launch, and receive a promotional code for $10.00 off any purchase. Promotional code must be redeemed by December 31, 2011 (11:59PM PST). Valid only within the contiguous United States while connected to the OnLive Service. No cash value. Game pre-orders may be cancelled and refunds are available only until the OnLive game launch of "L.A. Noire: The Complete Edition". Any cancellation and refund voids the promotional code. Contact OnLive Customer Service for cancellation and refund requests at http://support.onlive.com. NO RETROACTIVE DISCOUNTS. Purchase a Full PlayPass for "L.A. Noire: The Complete Edition" between 21 October 2011 (9:00 AM BST) and the OnLive game launch, and receive a promotional code for £5.00 off any purchase. Promotional code must be redeemed by 31 December 2011 (11:59 PM GMT). Valid only in the United Kingdom while connected to the OnLive Service. No cash value. Game pre-orders may be cancelled and refunds are available only until the OnLive game launch of "L.A. Noire: The Complete Edition". Any cancellation and refund voids the promotional code. Contact OnLive Customer Service for cancellation and refund requests at http://support.onlive.com. NO RETROACTIVE DISCOUNTS. 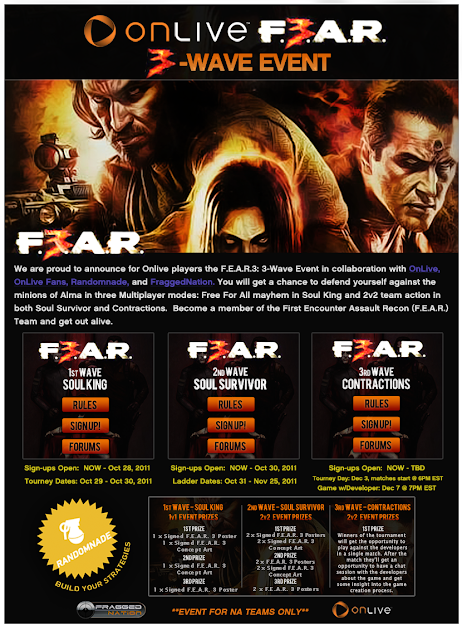 Just in time for Halloween, OnLive is going to be rocked by one of the spookiest games around, F.E.A.R. 3. FraggedNation, OnLiveFans, and OnLive are teaming up to invite you to show off your skills in a series of tournaments featuring three waves of competitions. Don’t own the game? No worries, you can either buy it, play through a free 30 minute demo, or play via the PlayPack, which now hosts the multiplayer portion of F.E.A.R. 3. The first tournament runs on the weekend of October 29, so be sure to head over to FraggedNation and sign up. 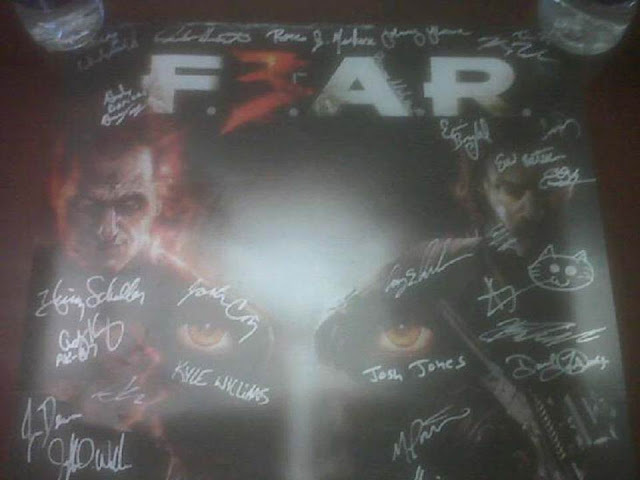 There are some VERY nice prizes, including signed posters from the development team. You can see the beautiful prize in the picture below. Speaking of the development team, you can see an interview with them here. If you would like to have your own interview with them and/or show them who is better at playing their own game, then be sure to partner up and join the third wave of the tournament. Winners of December 3rd’s tournament will get to prove themselves by playing against the development team, in front of many fans. The sixth and last game of OnLive's week-long THQ daily deals sale in the UK is Red Faction: Armageddon, which was developed by Volition. The game currently sels for £29.99, but today you can get it for 75% off, so the game is yours for £7.50. PlayPack subscribers off course can get the game off for additional 30%, to get it for the cool price of £5.25. This deal is not valid for OnLive US customers and concerns only OnLive UK customers. You can play the free demo of Red Faction: Armageddon powered by OnLive. OnLive Community Manager, Matt Jensen, challenged his boss by predicting that OnLive could achieve their goal of 62,791 likes on Facebook by this upcoming Saturday. If OnLive was able to reach this goal, every US gamer would be eligible for a $1 game of their choice. If not, well we’ve heard speculation that Mr. Jensen will be shot with a t-shirt gun. Good news for the OnLive US gamers and Mr. Jensen’s ribs! OnLive has easily reached their goal in a record setting fashion of about 7 hours! Everyone saw the 10,000 new followers as a daunting challenge, but the OnLive fanbase has flexed their e-muscles by reaching their goal not on Saturday not even Friday. The 10,000 like goal was reached before the end of thursday. WOW, you all just exceeded my wildest expectations. We added 10,000 OnLive fans in about 7 hours! 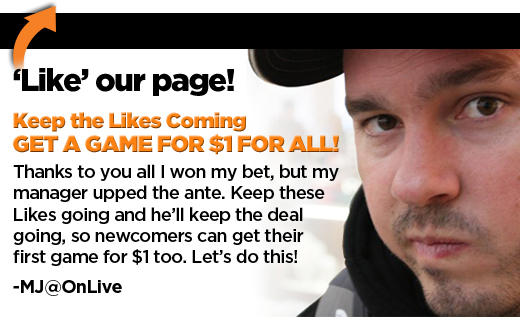 That means WE won the bet, and every US OnLive user is going to get their next Full PlayPass game for $1! Look for an email tomorrow morning for your promo code and details! You guys proved me right, Thank you! – Onlive MJ. Thanks to everyone who participated. OnLive US users can expect an email tomorrow with information regarding your $1 game. Now, what game will everyone be picking up? You can still go like OnLive on Facebook. OnLive games that do not utilize OnLive’s Software Development Kit will not only have multiplayer disabled, but any game not implementing the SDK will also be denied PlayPass release and will automatically release for OnLive’s subscription based PlayPack. Alexander Zubov, founder of Kot-In-Action Creative Artel, who recently released their first OnLive title, Steel Storm: Burning Retribution, said this in an interview, when asked about how was working with the OnLive SDK, "We did not use the OnLive SDK for Steel Storm as we wanted to bring the game to the gamers in the shortest possible time. Our next title might take full advantage of the OnLive SDK." On the question, why they decided to release the game as a PlayPack title, he replied, " PlayPass requires us to use the SDK and since we didn’t use it, the game automatically releases in the PlayPack." Finally, when asked if the game features multiplayer, he said, " The OnLive version currently does not offer multiplayer capabilities. We have to integrate the SDK in order to enable the multiplayer." OnLive Informer concluded an exclusive Interview with Alexander Zubov, founder of Kot-In-Action Creative Artel, who recently released their first OnLive title, Steel Storm: Burning Retribution. Kot-In-Action is a very small indie studio based out of Del Rio, Texas. The team consists of two full-time members as well as several part-time members around the world. The team began their careers in video gaming as modders for ID Software’s Quake series. Their interview was focused on the overall process of porting a game to the OnLive service. Interestingly, according to Kot-In-Action, a game which does not utilize OnLive’s Software Development Kit will not only have multiplayer disabled, but any game not implementing the SDK will also be denied PlayPass release and will automatically release for OnLive’s subscription based PlayPack. Read on below for the full interview. The events around Steel Storm: Burning Retribution take place in an alternative universe where you control an advanced hovertank, packed with the most advanced and sophisticated weapons. Your task is simple but nevertheless, is not trivial. In the fight with presumed extraterrestrial invaders, you must prevail! Informer: Having just completed your first-ever port to the OnLive system, how did you like it? Alex: It was a pleasant experience. We just had to tune up the menu and add a virtual keyboard. The rest of the game is pretty much the same as on PC. Informer: I’ve read that you wanted to bring Steel Storm to mobile devices. Did this help sway you to OnLive with the iPad and Android apps expected to release this year? Alex: The decision to make an OnLive port was unrelated to desires to have Steel Storm on mobile platforms. We still would love to get the game running on the mobile platforms natively, but now that you mention OnLive for iPad and Android, I am thinking maybe we can provide a great experience for mobile gamers sooner rather than later, using the OnLive platform. Informer: Overall, how long was the porting process and how did it compare to say, bringing the title to Steam? Alex: It was a relatively short process. It took us maybe a week or two to finalize the port. As the game was designed for PC, you can imagine the process of putting it on Steam (on the technical side) took less time. Informer: Was working with OnLive’s SDK complex at all or did you run into any trouble? Alex: We did not use the OnLive SDK for Steel Storm as we wanted to bring the game to the gamers in the shortest possible time. Our next title might take full advantage of the OnLive SDK. Informer: What made you decide to add it as a PlayPack title instead of for PlayPass? Alex: PlayPass requires us to use the SDK and since we didn’t use it, the game automatically releases in the PlayPack. Informer: How was the overall process of adding gamepad support? Alex: The game natively supports Xbox 360 gamepads and any standard Windows-compatible gamepads. Therefore the support was available already. Informer: I believe ‘Steel Storm’ was the first title to release to OnLive that utilizes the DarkPlaces Engine. Did this complicate things at all? Alex: Not at all. The only thing we had to fix and enable was the Direct3D 9 renderer (DarkPlaces Engine has both OpenGL and Direct3D renderers, but by default it uses the OpenGL renderer). We are certainly hoping for more titles that utilize the DarkPlaces Engine to come to OnLive. Informer: Now about the game. It's nice to see the prior Humble Bundle games getting access to the service. How would you describe Steel Storm to players who’ve never heard of it? Alex: Steel Storm: Burning Retribution is a third-person arcade shooter with old school spirit, hordes of enemies, destructible worlds, ground-shaking explosions. The player drives a hovertank called Steel Storm through the enemy’s front lines, completing mission objectives and earning the highest score possible, and Challenges, aka Achievements. The game has an unlockable chase camera view, a bunch of powerful and destructive weapons, huge bosses and smart enemies. If you have an appetite for destruction and exploration, a dash of tactics, and core old school style gameplay, you will enjoy playing Steel Storm. Informer: Roughly how long would you say the game is? Alex: The PC demo version includes approximately 40 minutes of gameplay on Arcade difficulty (easy). The demo is only the tip of the iceberg, The full game contains approximately 20 hours of gameplay, depending on your skill and the difficulty level. Informer: Does ‘Steel Storm: Burning Retribution’ feature multiplayer or co-op? Alex: The OnLive version currently does not offer multiplayer capabilities. We have to integrate the SDK in order to enable the multiplayer. Informer: Thanks for your time. Is there anything you would like to add for our readers? Alex: Thank you for interviewing me. We hope OnLive users will enjoy Steel Storm: Burning Retribution! Today is friday, so it is time for the fifth and final game of the 5 Days of $5 Fridays Finale by OnLive. And the game in honor of this title is truly deserving, let us all hail to the king, that is Duke himself in his latest adventure Duke Nukem Forever. Today, Duke Nukem Forever, a game published by 2K Games and developed by Gearbox Software, can be yours for, guess what, $5. Off course PlayPack subscribers can get the game even cheaper, in this case $3.5. You can play the free demo of Duke Nukem Forever powered by OnLive. The fifth game of OnLive's week-long THQ daily deals sale in the UK is Warhammer 40,000: Dawn of War II Chaos Rising, which was developed by Relic Entertainment. The game currently sels for £19.99, but today you can get it for 50% off, so the game is yours for £9.99. PlayPack subscribers off course can get the game off for additional 30%, to get it for the cool price of £6.99. This deal is not valid for OnLive US customers and concerns only OnLive UK customers. In THQ Inc. and Relic Entertainment's sequel to the acclaimed Dawn of War II real time strategy franchise, you return to sub sector Aurelia where a long lost frozen ice planet has reappeared from the warp, bringing with it new secrets to uncover and foes to face. In Dawn of War II: Chaos Rising you will take command of the Blood Ravens and defend the sector against the chaos space marines of the Black Legion. Purge the chaos filth and hold the chapter together as traitorous forces work from within to try to bring down the Blood Ravens. You can play the free demo of Warhammer 40,000: Dawn of War II Chaos Rising powered by OnLive. OnLive Released Orcs Must Die!